Claire is 8. EIGHT. Why does this feel so much older than 7? (or "sebben" as Cora has spent the last year wistfully referring to it.) This chunky baby biscuit turned highly accessorized toddler turned long and lean big kid, my baby girl, Landon's first baby, the one who made us a family of four who would want to become a family of five is 8. She is all the things I wrote about her in this post and so much more. She remains my snuggliest, my one who most needs the attention of others. She's a great reader, but she only wants to do it if she can read out loud to you. She's independent and strong, but she'd love it if you just came to do the things with her. She can shower on her own, but couldn't you just come check to make sure her hair is rinsed out? Her coloring is the most like mine, particularly when I was her age, which must be why it continually baffles me that her personality isn't like mine at all. She has taught me much, she will teach me more, she is our Clairebear and she is 8. We celebrated with a Greatest Showman birthday party. For the first time since we moved to this house and celebrated Claire's 2nd birthday we did not have a pool party. At first I was flummoxed. You want to do something that isn't just swimming with your friends? I need to plan an activity? You want your friends INSIDE our house? But I feel like we pulled it off. There's not a lot of Greatest Showman paraphernalia yet so we went with the general color scheme and some items pulled from the "magic show" and "movie party" sections of Party City. It worked. Claire picked cheese balls and animal crackers as her snacks, we made a candy bar for take-home treats, and there was ice cream cake for later. For the activities Claire felt strongly there should be singing to the Greatest Showman soundtrack (aka the soundtrack of our lives for the last several months) and a serious and focused viewing of the movie. I told her I really felt there needed to be something to do during the movie because it can be hard to focus for that long ("Not on the Greatest Showman!" she cried) and I would hate for her friends to be bored and distracted and her to be sad no one is staring at the screen with her. So we went with a craft. Claire loves a good craft. A cruise around the aisles of Michaels last weekend led me to the idea of "dream boxes" from Claire's very favorite song, "A Million Dreams." We bought boxes and paints and lots of decorations, plus a large tarp to put under it all so James would be able to attend without having a breakdown. Before the art there was lots of singing and then a choreographed show Claire and one of her besties put on after they practiced at recess last week. It was adorable. The movie was a hit and I fast-forwarded some to get to all the songs by the end. Cora, exhausted from all our partying at the Last Day of School pool party the night before, didn't want to miss out on the movie, so she wordlessly pulled up a nap mat and snuggled in. Not much gets between Cora and her rest. With the dream boxes complete and fairly minimal mess made (8 year old girls are pretty solid crafters; there was some serious ART going on at that table and I loved it), we moved on to cake. Claire had requested a fancy candle she'd been admiring in the aisle of our local grocery store and, feeling generous, I'd thrown it in my cart during a round of pool party errands earlier in the week. Readers, that candle scared the crap out of her. She did not at all think it needed to be blown out. Cora found the whole thing highly irresponsible and knew she'd been right to be skeptical of cake all along. But Claire persevered, blew out the fire blazing on our kitchen table to save the ice cream cake melting underneath. Landon has now requested one for his birthday in July. All in all I feel like our first non-swim party went okay. And since it was 109 degrees outside that day (actual temperature! opening the door was like getting punched in the face by the sun), I was actually really glad we were all inside! James and I got everything cleaned up, a re-watching of Greatest Showman going on the living room TV for the birthday girl, and both fell onto the couch where we were soon joined by a sleepy Cora. Three parties in six days. Good thing we have five whole weeks before Landon's. Sunday was relaxed and gorgeous. We slept in, I made our shopping list, but as I walked outside to go to the store I realized the air wasn't already heavy with heat and humidity and I ran inside yelling, "WE'RE GOING ON A WALK!!". A cool front had come through in the night and it was a genuinely lovely 78 outside at 9 a.m. So a walk was had, errands were run, and then friends came over to swim before we headed to their house to test out a new smoker. I made two of my favorite side dishes. Kids played, adults watched the world series for women's softball. It was a solid end to a CRAZY week. And on Monday, it was Claire's real birthday! The day she actually turned 8. The morning 8 years ago I remember so very clearly. Landon's birth was such a shock and then Claire's was so planned and scheduled. We decorated the table the night before. Landon had come out to check up on all the activity and added his own gift. He loves a nighttime table decorating and Claire loved the results. Landon had made her a ring with his 3D pen and we got her a much-requested water bottle (with monogram sticker because it felt very Claire to me) and Caboodle full of tiny special things for my little pack rat hoarder. The best gifts are the ones you don't want to buy (I hate tiny hoarded things) and she LOVED IT. I did love my Caboodle growing up and was thrilled to find them back on Amazon. The caboodle and its contents are now Claire's greatest treasure. My parents got her two new outfits and a gift card to Michael's (to buy more tiny things to put in the caboodle!) and I used my grandparents' birthday check to buy her a Mighty music player which she loves. She's our musical girl and I love that she can have her own playlist that doesn't need wifi or a data plan to play on her headphones or little bluetooth speaker. She rocks around the house with it all day and it reminds me so strongly of my sister and I loving our new walkman's (with cassette tape and radio options!) back in the day. Then she and Landon went to James's swim camp, Cora went to school, and I went to work. Claire requested last minute birthday cupcakes and I figured why not, so I stopped on the way home to pick up a box mix to make up while the kids were at afternoon swim practice (swimming was a theme of this week; 7 practices in 4 days, which is a lot even for our crew!). I accidentally made too many so I texted friends to please come by and help us eat them after dinner. 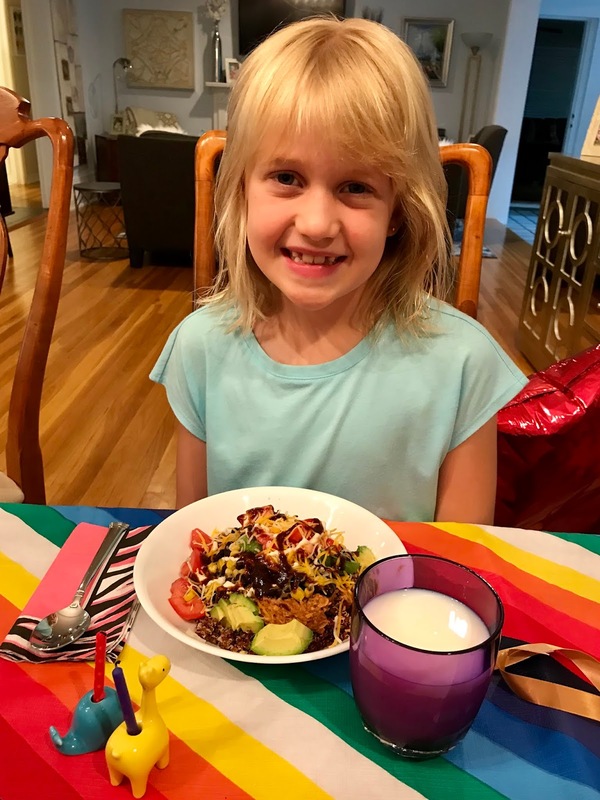 A dinner that was Claire's choice so of course it was... BBQ QUINOA SALAD!!!! She says it just like that, in all caps, and with many exclamation points. Claire LOVES this meal and she eats more of it than anyone at the table. Did you spy our new birthday candle animals? We've had the dinosaur and pig for years (since 2010) and a blog reader found me a full set on eBay earlier this year, so the giraffe and whale were huge and exciting surprises for Claire. And Landon doesn't even know we still have more for him in July. I love little traditions and candle animals are a sweet one. Obviously we re-lit them both for dinner and then she blew out a non fire-hazard candle for dessert. Happy birthday sweet sunshine girl, we sure do love you! Lovely. Happy 8th birthday, Claire.